Princess Fiona (Hayes junior Bella Bosco) converses with Shrek (senior Ryan Hawkins) and Donkey (Griffin Clark) during a rehearsal of “Shrek the Musical” on Monday. The musical will run at the Hayes Performing Arts Center on Thursday, March 8 at 7:30 p.m., on Friday, March 9 at 7:30 p.m. and will offer two showings on Saturday, March 10 at 2 p.m. and 7:30 p.m. The musical will run at the Hayes Performing Arts Center on Thursday, March 8 at 7:30 p.m.; Friday, March 9 at 7:30 p.m.; and Saturday, March 10 at 2 p.m. and 7:30 p.m.
Parent volunteer Gina Calcamuggio said the musical adaptation of the 2001 DreamWorks film is being directed by Clay Thomson, a Hayes graduate making his musical directing debut. Calcamuggio said close to 100 students are involved in the cast, crew and orchestra pit of the show. Thomson and assistant director Mark Tegtmeier said Shrek is a show for everyone because children will enjoy their favorite characters, and adults will enjoy the humor, great music, and dancing of this beloved show. Calcamuggio said Hayes senior Ryan Hawkins undergoes a 60- to 90-minute makeup transformation including ear horns, a new nose and chin to play Shrek. Calcamuggio said senior Wes Kunkle plays the small-in-stature villain Lord Farquaad, which presented a unique challenge for Linda Hurley, costume designer. “I’ve never had to design a costume for a student who spends the entire show on his knees!” Hurley said. Calcamuggio added Kunkle will sing, dance and command the stage all from his knees for the duration of the show. Hurley said she thinks audiences will appreciate the bright, playful, colorful nature of the show and costumes. Calcamuggio said the set design and construction crew, led by Erin Hurley, has put a lot of work into creating the sets where the musical will play out, including a swamp and a castle, complete with a lava bridge. The biggest cast member, however, is the dragon guarding the castle, which takes four people to operate. Tickets are $12 for adults and $10 for seniors and students. Tickets can be purchased in advance online at http://delawarecityschools.seatyourself.biz and at the door on the day of the show. 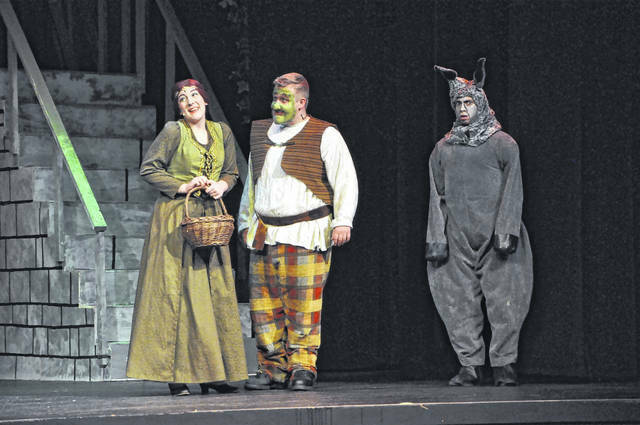 https://www.delgazette.com/wp-content/uploads/sites/40/2018/02/web1_Shrek.jpgPrincess Fiona (Hayes junior Bella Bosco) converses with Shrek (senior Ryan Hawkins) and Donkey (Griffin Clark) during a rehearsal of “Shrek the Musical” on Monday. The musical will run at the Hayes Performing Arts Center on Thursday, March 8 at 7:30 p.m., on Friday, March 9 at 7:30 p.m. and will offer two showings on Saturday, March 10 at 2 p.m. and 7:30 p.m.